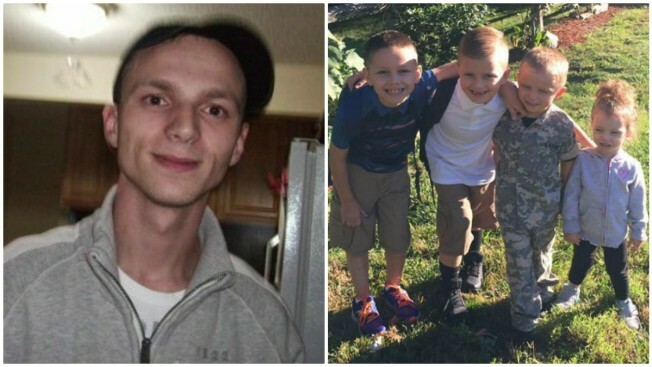 Police in Salem, New Hampshire, are looking for Matthew Giovanditto and his four children. He allegedly took the children to Colorado and is refusing to bring them home to their mother in New Hampshire. Police in Salem, New Hampshire, are searching for four missing children believed to have been taken by their father in a case of custodial interference across state lines. The children's mother filed a police report Monday saying that her ex-husband had driven their four children to Colorado and was refusing to bring them home. The mother has full custodial rights and made an agreement for their father to take the children for a short time while she got situated. Police said the father is now refusing to bring the children back to New Hampshire. They range in age from 3 to 9. The father, 30-year-old Matthew Giovanditto, has a last known address in Taunton, Massachusetts, according to police. He is believed to be driving a white 2015 Chevrolet Traverse with New Hampshire disabled veterans plate 2559. He is believed to be hauling a white 2000 Jayco Eagle pop-up camper with New Hampshire registration T400759. Police said they believe Giovanditto and the four children have been staying in campgrounds and parking lots in the Denver-Colorado Springs area, but that has not been confirmed. Anyone with information on the whereabouts of Giovanditto and his children is urged to contact Salem police Detective Mike Geha at 603-890-2321.